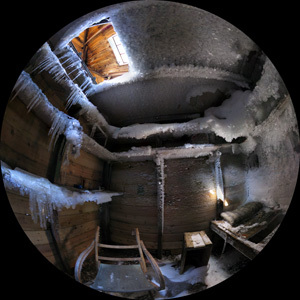 "Frozen in Time" is a production by Peter Morse. The following are some notes arising from my first experience creating an 8K by 8K (8192 pixels square) fulldome show for one of the new breed of digital planetariums that are capable of presenting that resolution. The show itself is by Peter Morse and called "Frozen in Time". It had already been produced at 3600x3600 pixels in collaboration with Horizon - The Planetarium. The show consists of panning around within full spherical panoramic images of the Mawsons huts in Antarctica. 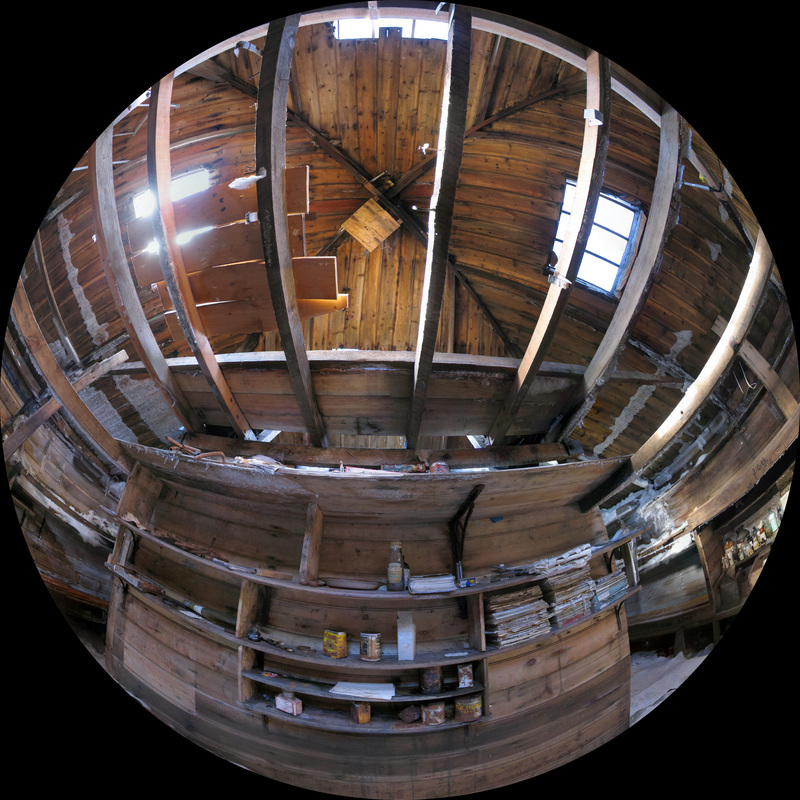 The spherical panoramas are of sufficiently high resolution (typically 20000 x 10000 pixels) to support the generation of 8K square fisheye projections. In total the show runs for almost 6 minutes 45 seconds, but discounting credits the fisheye panning runs for about 6 minutes. The software used to create the raw sequences in the original production was sphere2fish, post production with FinalCutPro. 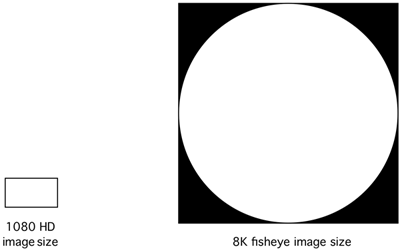 While 8K square output images are possible from most (but not all) rendering packages, this includes the locally developed "sphere2fish", it is a very different story with compositing software. The two packages generally used for in-house work are FinalCutPro (Mac OS-X) and Premier (MSWindows). At the time of writing neither of these were capable of greater than 4096 pixels. Frustratingly (for another project) FinalCutPro has the limit set arbitrarily to 4000 pixels! While these limits may have been arguable a number of years back, there are a whole range of camera systems capable of larger frame sizes and an increasing number of display systems capable of matching resolutions. For example, the LadyBug-3 camera has a native resolution for video capture of 5400x2700 pixels. Fortunately for this production the requirements for the transitions and titles were modest. The solution then was to develop local software that acted upon the frames following simple instructions provided as a script. Examples of the script instructions were "fade out linearly from frame 4600 to frame 4750", or "overlay title sequence from frame 1000 to 1200". In total there were no more than 6 different operations required. The pipeline is shown below, while the time for each section varies the averages per frame are: fisheye generation 220 seconds, transitions 50 seconds, composite 40 seconds, and png 55 seconds. For 12000 frames that is a total of just under 51 days of processing. This was split across 8 CPUs with the aim of completing the processing within a week. The entire pipeline consisted of locally developed software running in Unix (Mac OS-X). The underlying software had a number of parameters, one being the frame size, another the degree of antialiasing. This meant that the entire sequence could be computed at a lower resolution to verify everything was functioning as expected. These lower resolution versions could be computed very quickly, for example a 512 pixel version without antialiasing could be generated within an hour. The consequence being that when the final 8K version is computed there is a high confidence that it will be correct the first time. Since all stages of the pipeline consisted of locally developed software tools, the most straightforward format to use was TGA. Certainly not an efficient format but it is lossless and capable of being read and decoded much faster than the likely alternatives (TIFF and PNG). Note the run length encoding was used rather than the uncompressed variant. This gives a lossless format through the entire image processing stages, the final frames were then converted to PNG for distribution. An unfortunately characteristic of PNG is that the reading/writing is not symmetric, that is, compression is much slower than reading mainly due to the need to create the initial dictionary of sequences. On the hardware used a simple conversion from TGA to PNG took one minute, may not sound like much but for a 6 minute production the final image conversion would take a total of 8 days (if a single computer were used). 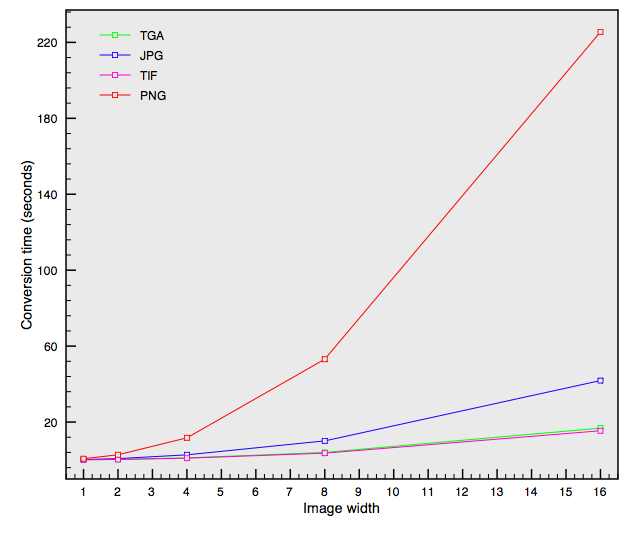 The above graph shows conversion times for various file formats. As it happens TGA is perhaps surprisingly not a bad choice for such a pipeline even though the above timings include file IO for which TGA has a disadvantage. Note that PNG can convert faster if it generated with a lower dictionary size, the timings above use the optimal dictionary and thus smallest file sizes. Three sample frames from the animation are given below, note that they are presented here as JPEG for size reasons only. JPEG was not used at any stage in the production and indeed no lossy compression should be employed for obvious reasons despite the file size savings. Average files sizes for the TGA frames during the pipeline was 145MB, that is, frames that were non-trivial. Note that since the run length encoding really only reduces the border (outside the fisheye circle) these frames are only slightly less than the uncompressed size of 192MB. The final PNG files were on average 70MB each, these are only generated at the last stage of the pipeline. For 30fps this then works out as just over 2GB per second, or 120GB per minute. Interesting to note then that this relatively short production saved as PNG, which has one of the better lossless compression ratios, requires almost a terrabyte drive for distribution. Fortunately these drives are now relatively low cost except the interface is rather slow, see next point. It is interesting to compare 8K fisheye image size with a full HD image (1920x1080). In terms of image area (ignoring the fisheye fringe) the ratio of active pixels is pi 40962 / (1080*1920) = 25. This is therefore the multiplier one needs to consider for raytraced content for example. For image based operations the ratio is simply 8192 * 8192 / (1080*1920) = 32. As an indication of how operations one would not normally give a second thought to in most shows can be more important for an 8K production. At 70MB per frame a 6 minute production can take a significant time to move between disks. The following tables gives upper limits for a few interfaces, in reality the quoted bandwidth of the standard is rarely met. For example, while SATA based drives are rated at 1.5, 3, and 6 Gbits/sec in practice it is hard to get above 100MBytes/sec sustained. Invest in fast large drives. For transfer media keep away from cheap USB-2 drives and invest in Firewire-800 drives. For production I would now choose fast external SATA drives with a high bandwidth interconnect. Much of the above pipeline can be significantly improved using GPU programs. 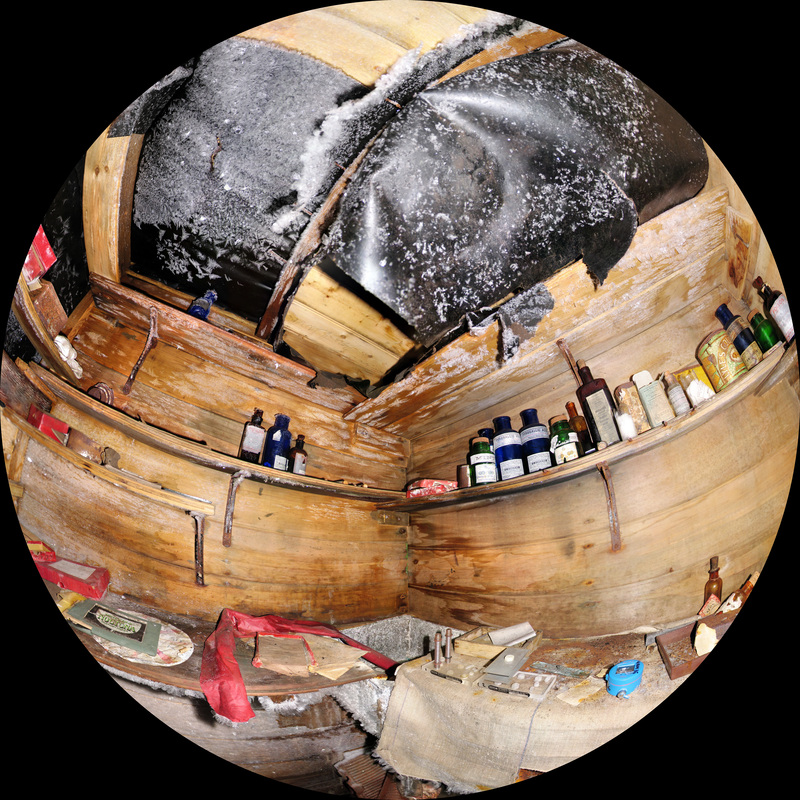 For example the fisheye from spherical panorama has subsequently been implemented in cuda, this reduces the image mapping from 220 seconds to under 30 seconds (including file IO). It is interesting to consider the consequences for raytraced rendering. Being a pixel based rendering it increases as the square of the linear dimension of the image. For example, Fulldome Geometry Series: Part 1 was raytraced as 4K fisheye, only made possible by significant access to a 200cpu facility. The equivalent at 8K will take 4 times longer. Do not assume your favourite rendering or compositing software will handle 8K images. Many packages now use the graphics card for effects and image processing, they achieve this using textures on the graphics card. Many cards (at the time of writing) have a limit of 4K for texture dimensions. Don't use PNG for multiple file read/writes, it is a format that needs a high CPU load for compression.